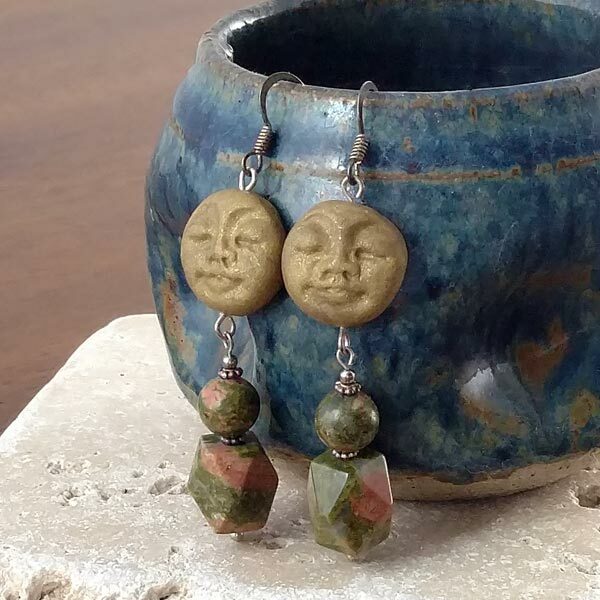 Helps to balance and align the emotional body and uproot deeply suppressed feelings, bringing them to the surface to be considered in a more rational manner for healing. It is also believed to unearth the root cause of a particular problem, fostering a greater understanding of the body-mind-spirit relationship as it applies to illness, and subsequent healing. It is particularly useful in facilitating both the birth process, and rebirth as an emotional process as well. Unakite is in the silicate group of minerals and is composed of red feldspar, green epidote, and quartz. It starts as green epidote that has been surrounded by alkaline rocks rich in calcium and aluminum and this is where it begins its transformation. 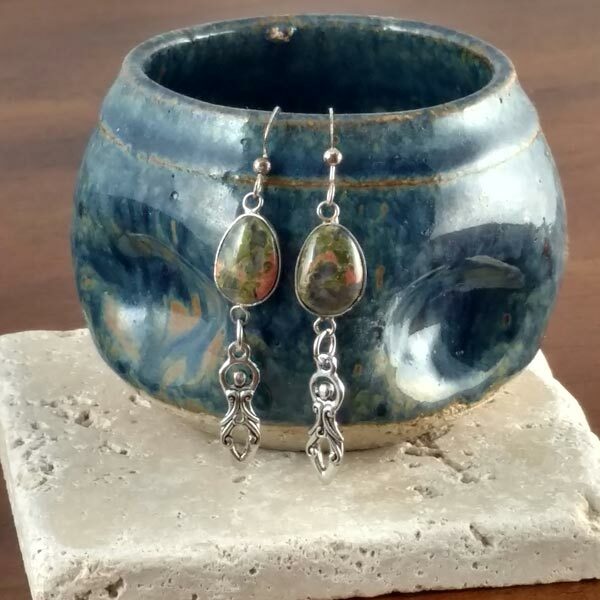 When magma superheated this epidote mix, it became mingled with red feldspar and created the equivelent of a stone soup of sorts which flowed around larger quartz crystals. The pressure from the magma below pushed this 'soup' up and crushed the quartz it was surrounding into small chips. 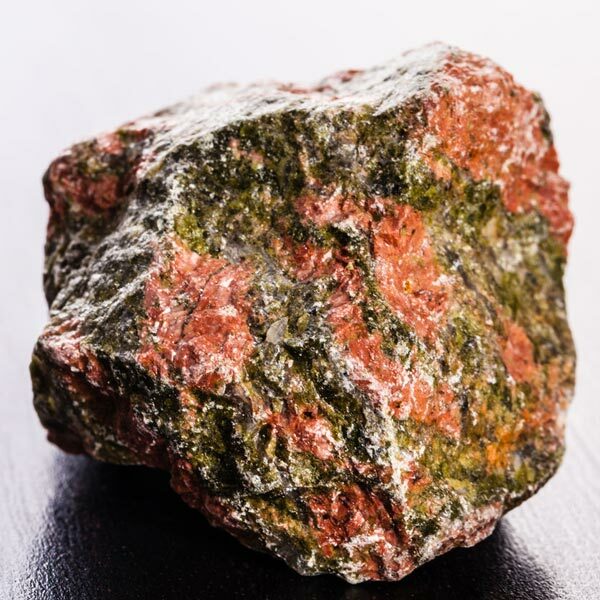 As it worked its way up to the surface and cooled it was reborn into what we know today as Unakite. I have found the most obvious effect of Unakite occurs during meditation. A piece can be laid on the forehead or on the solar plexus. A nice effect can also be achieved by spending time in a Unakite circle. The effect of sitting in a stone circle is that it noticeably stimulates the regeneration of mind and spirit. Unakite can be worn for long periods of time as a chain of beads, a pendant or just carried in your hand. It can also be laid on an afflicted part of the body in cases of acute illness. Unakite bestows patience. It assists in dissolving false self images and highlights the weaknesses and strengths of our true self. This can result in desires for change that are realistic so they can be obtained. It can take one back to the original positive inner image of a healthy and happy existence which is the meaning of regenerate (rebirth). 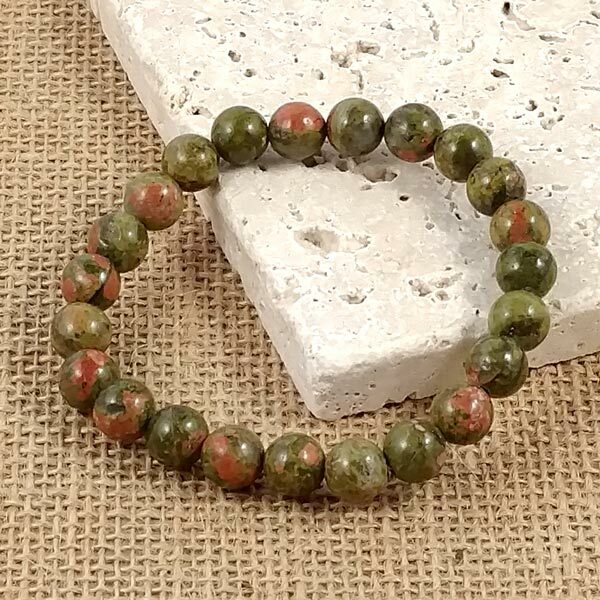 Unakite encourages recovery and regeneration after severe illnesses or cases of great exhaustion caused by overwork, stress and painful experiences. It lifts emotions and dissolves sadness, sorrow and self-pity. It will also help to overcome frustration caused by failure and teaches us not to come down on ourselves because of mistakes we have made. Unakite improves our capabilities. It can assist us in living up to our own demands on ourselves ... appropriately. That is, with consideration of our own strengths and abilities and saves us from failures by accepting and admitting our weaknesses. If we gradually increase these demands, our own capabilities can be harmoniously expanded and developed. Unakite strengthens the constitution, our general condition, stimulates the immune system and generally supports all healing processes. It will also stimulate the liver in its function as our central organ of regeneration and improves the processes in the small intestine. What this means is that we are able to absorb more nutrients into our bloodstream which, in turn, builds us up and fortifies us. 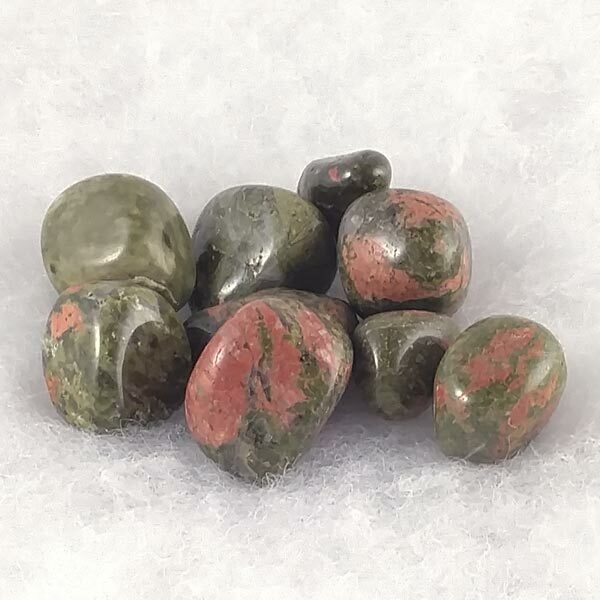 While Unakite has a special affinity with Scorpio, Pisces and Virgo, it does benefit all signs. It has a Magnetic Energy, its Planet is Neptune, and its Element is Water. Unakite was not identified as a separate mineral until the beginning of the nineteenth century when it was discovered in America, in the Unakas mountains of North Carolina (thus the name Unakite). So, there is not much folklore on this one. I did however, come across a claim that says Unakite can neutralize the harmful effects of electromagnetic radiation from video screens. I am not sure how this could be measured, and it is a departure from what the known healing capabilities are.